Honey bees have become the canaries in our mines; their mysterious and massive disappearance reveal the manifold costs of human misappropriation, exploitation and destruction of nature. Chip Ward is a former public library administrator and grassroots activist turned writer/advocate. His book, Canaries on the Rim: Living Downwind in the West, is an account of his campaigns to make polluters accountable, and Hope's Horizon: Three Visions for Healing the American Land explores the cutting edge of America's conservation movement. He writes from Torrey, Utah. The following passages are taken from his July 2007 essay, "Diesel-Driven Bee Slums and Impotent Turkeys: The Case for Resilience," which appeared in TomDispatch. One of The Christopher Reynolds Foundation's current grantees, Spikenard Farm in Illinois, is devoted to understanding and renewal of natural honey bee communities. Also: read Elizabeth Kolbert's essay, "Stung," in The New Yorker issue of August 7, 2007. 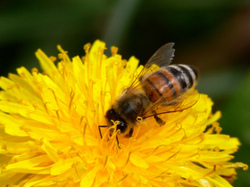 And listen to Kolbert's 8-minute discussion, "Bearish on Bees," by clicking here. Our current economic system is designed to maximize outputs and minimize costs. (That's what we call efficiency.) Efficiency eliminates redundancy, which is abundant in nature, in favor of finding the one "best" way of doing something -- usually "best" means most profitable over the short run -- and then doing it that way and that way only. And we aim for control, too, because it is more efficient to command than just let things happen the way they will. Most of our knowledge about how natural systems work is focused on how to get what we want out of them as quickly and cheaply as possible -- things like timber, minerals, water, grain, fish, and so on. We're skilled at breaking systems apart and manipulating the pieces for short-term gain. Think of resiliency, on the other hand, as the ability of a system to recover from a disturbance. Recovery requires options to that one "best" way of doing things in case that way is blocked or disturbed. A resilient system is adaptable and diverse. It has some redundancy built in. A resilient perspective acknowledges that change is constant and prediction difficult in a world that is complex and dynamic. It understands that when you manipulate the individual pieces of a system, you change that system in unintended ways. Resilience thinking is a new lens for looking at the natural world we are embedded in and the manmade world we have imposed upon it. In the world today, efficiency rules. The history of our industrial civilization has essentially been the story of gaining control over nature. Water-spilling rivers were dammed and levied; timber-wasting forest fires were suppressed; cattle-eating predators were eliminated; and pesticides, herbicides, and antibiotics were liberally applied to deal with those pesky insects, weeds, and microbes that seemed so intent on wasting what we wanted to use efficiently. Today we are even engineering the genetic codes of plants and animals to make them more efficient. The recent collapse of honeybee colonies across the United States provides a compelling example of how we removed resilience from a fundamental ecological service -- pollination -- to make it more efficient and the unexpected blowback we are now suffering from that. In this case, there is little resilience in the manmade system of food production that relies on healthy populations of commercial bee colonies to pollinate crops and too little resilience left in the natural world for bees to recover quickly from whatever is wiping them out. Pollination is a fundamental process that happens many ways -- birds do it, bees do it, even butterflies and moths do it. But humans who grow food rely almost exclusively on bees; and not the hundreds of species of wild bees either, but one bee, the European honeybee. Sometimes resilience in nature is the availability of diverse options to fall back on in times of disturbance, but even when there is one choice, like bees for pollinating crops, there are still resilient features, redundancies that we eliminate at our peril. For hundreds of years, numerous dispersed and varied bee populations meant that a scarcity of bees here could be compensated for by an abundance of bees there. Not anymore. We have grabbed this key ecological process to maximize its use and have wrung out what resiliency there was. Although the widespread disappearance of bees from our landscapes sounds like the stuff of melodramatic science fiction, like those movies about Ebola virus or asteroid strikes, the situation is both dire and all too real. Bee-tracking experts estimate that, across 26 states, between a half-million and a million of 2.4 million bee colonies have collapsed this year. Because many fruit, vegetable, and seed crops, worth about $12 billion annually, rely on the most affected bee, the European Honeybee, for pollination, bee loss will translate into increased food costs for consumers and a potential loss of food variety as well. This note comes by way of my refrigerator, where I just posted this admonitory observation of the incomparable Australian cartoonist and social critic Michael Leunig. 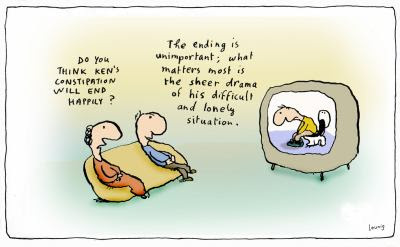 Though his profession may be listed as "cartoonist" on his tax return, Michael Leunig is much more. Although his work is at times incredibly mirth provoking he is not so much a humorist as an observer, philosopher, commentator, historian of the absurd and catalyst for free thinking. 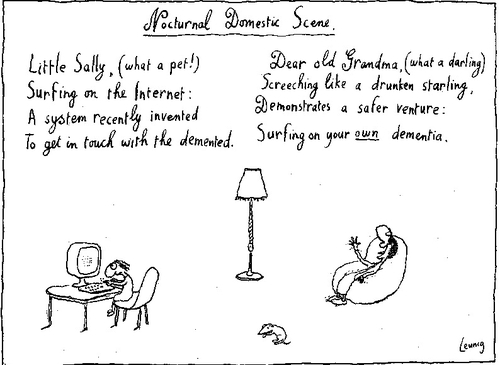 Born in East Melbourne (Victoria, Australia) in 1945, Leunig subsequently evolved in Footscray, an eclectic inner industrial suburb, until his success as a satirical political cartoonist afforded him the means to escape the city in favour of the gentler ambience of nearby country environs. From his early work in the 60's when he was published in such diverse journals as Newsday, Woman's Day and the controversial London Oz magazine, Leunig developed his distinctive pen style and eye for the ridiculous which led to publication in 1974 of his first book The Penguin Leunig (see elsewhere on the site for a complete anthology). These days he lives somewhere near Melbourne where he is a regular contributor to the local daily broadsheet The Age and fridge doors all over the country. While most Australians are familiar with his work, few could tell you anything about the man and yet through his cartoons, know everything about him. By all accounts he is indeed shy, gentle and pensive, and his work reveals him to be cynical, witty, sensitive, deeply spiritual, emotionally precarious, at times depressed and always insightful. A dysfunctional genius perhaps. 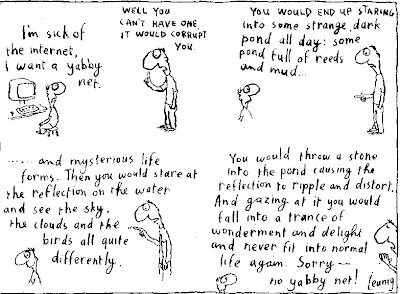 Michael Leunig simultaneously defines and defies most Australian stereotypes, and I, for one, am thankful. The words are from Isaiah. They serve as the text of the following reflections on the theme of trust by my son Joshua Boettiger. The occasion was his formal installation as rabbi of Congregation Beth El, in Bennington, Vermont, in May 2007. Erik Erikson proposed that the development of trust is the first, most primal task of human development, shaped by the character of the relationship between mother and infant in the first year of life -- a task never completed, evolving in dynamic balance with mistrust throughout the life cycle, underlying our capacity and expression of hope and care for ourselves and others. Joshua says that evtach v'lo efchad "is more a prayer than a statement of fact." When that prayer is consciously drawn into our regular and evolving practice, it becomes an instrument of the enduring task of human development Erikson describes. So the insights of psychology and religion unite and serve a fuller understanding and experience of our lives. I want to welcome everyone here this evening, and I want to thank you for coming. I won’t repeat the names of those we are particularly grateful to tonight, but I do want to name and thank one person who has done an extraordinary amount of work, and who has done an extraordinary job around making this installation weekend happen - Carrie Greene. I first came up to Bennington six years ago as the rabbinic intern at Congregation Beth El – and felt a real kinship with this town, with the area, with the Jewish community, and essentially said to myself: I’d love to find a town like that to settle in when I get ordained. And so, you know, sometimes you can’t stand in the way when poetry wants to have its way with you – it felt deeply appropriate when this job opened up in my final year of seminary. Even though the congregation and I have been working together now for nine months, it feels important to mark the beginning of this relationship. And I love what Adam said in his opening remarks around challenging one another. A chavruta in Judaism is one’s study partner. Chavrutas are supposed to learn together and debate l’shem shamayim, for the sake of heaven. The chavruta relationship is a sacred relationship, each partner working to bring out the best in the other, recognizing the unique gifts in the other, challenging the other lovingly. I think this model of chavruta, of being partners in study, is a fitting one to describe the relationship between a rabbi and a congregation. In Judaism, learning together is an act of serving God. It is said when two study Torah together, God is present. When this many of us study Torah together – which in a very real sense we are doing tonight – there’s a lot of God in the room. It’s a privilege to have come into this community, and to have been welcomed in such a full way. I don’t take this for granted. As it says in the program, tonight provides an opportunity to mark where Congregation Beth El is at this moment in time. It’s an amazing history. People who I talk to are always saying, that was originally built as a synagogue? There’s been Jews in Bennington that long? And indeed, 2009 will be our centennial as a community. We have gone through different incarnations and resurrections – and it is really an inspiring story throughout. We treasure our small, strong community, and we treasure our relationship with the larger community in Bennington and beyond. One other person who I want to thank, who I feel deserves special mention is Rabbi Howard Cohen – who served Beth El and the larger Bennington community for twelve plus years, who put so much of himself into this work and this synagogue and this town. And, among other things, did so much to bring our communities of faith in this town together around common projects. The theme we are working with tonight is evtach v’lo efchad. I will trust and I will not be afraid. I have been turning this verse over in my head these past weeks. Of course it is easier said than done. Though it originally comes from Isaiah, we say it during the havdalah ritual, a time when we are reluctant to say goodbye to Shabbat, a time when the sky is darkening, a time of transition, a time when our prayers are most filled with longing, a time of fear mingled with hope. And we hold up a full cup of wine, and we say: I will trust and I will not be afraid. It’s more of a prayer than a statement of fact. Aviva Zornberg says one only says, don’t be afraid, when one is, in fact, afraid. This past Yom Kippur, we talked about fear, and what a healthy relationship to fear might look like – so it feels appropriate now, to turn towards trust, to explore what that might look like to really learn how to move and live our lives from a place of trust. To choose trust, at least as much as we’re able. In the world we live in, we have grown increasingly accustomed to the politics of fear, and it seems, in my experience, that the automatic fallback place, or default position is often one of fear, even if it’s subtle. That if we’re not conscious of it, we tend to make our decisions - as individuals, communities, and as a nation - from a place of fear. We want to preserve, and so much around us announces so often how much we are in the process of, or at risk of, losing. Starting with the earth, I guess, and the environmental crisis, which I believe is the most pressing issue of our time – and working out, or in, from there. It seems too easy to move through the world as if it were a place of scarcity, and the best case scenario is simply holding on to what we have. So how to respond, how not to despair? It strikes me that trust is not something that just shows up one morning and announces itself. Perhaps trust comes in small moments, but then it retreats again. Maybe trusting is something we need to learn how to do, that it is an acquired skill. It has been occurring to me more and more that trust - the intention to cultivate trust – needs to be a practice. What does this mean? We need to develop habits that cultivate trust. Trust is not passive. Trust creates its own reality. I think this is among the primary roles religion can play: it can give us practices that teach us how to trust. There is the Jewish tradition of giving tzedakah (charity), or of hospitality, or of prayer that I might name as some trust practices, but of late, I have been thinking about the havdalah ritual itself. Now we do this ritual at the end of Shabbat, when there are three stars in the sky. We bless the wine, the spices, the light from the candle, distinction itself – all as a way of bringing some of the spirit of Shabbat with us into the week. This ritual is the beginning of a trust practice When it’s Shabbat, we are in Shabbat mind – mochin gadlut, as the rabbis called it, ‘big mind. Shabbat is trust. It’s essentially saying, OK, we’re all together now, we’re in this Shabbat mind of abundance and fellowship, but the regular week is about to begin – how can we hold onto this reality as we go back to our lives? Put differently, how can we remind each other to trust when we fall back into the daily rhythms of fear? There’s a Rebbe Nachman story of a King and his faithful advisor. The advisor tells the king that there is a diseased wheat crop, and everyone in the kingdom has eaten from this diseased wheat and become mad. The men realize that either they eat of the crop and become mad as well – or – they don’t eat of it. But if they are sane and everyone else is mad, it will appear as if they are the ones who are mad! This feels a little bit like fear as it drives our society – that we’re catching this fear from what we eat, what we take in, or imbibe, as we go through each day. In the end, they decide to eat the wheat, but before they do so, they each put a mark on the other’s face, so that, even in the midst of madness, they can look at one another, and be reminded by that mark, by the other, of what is really true. So we could call this the mark of trust in the other’s face. How much we need each other. One person cannot have enough trust by himself. And the rabbis say that about the mitzvot as well. There are 613 mitzvot in the Torah, but an individual cannot keep all those by him or herself. We need a community to keep them – literally. So we can remind one another. We can look at each other and say: right, it’s OK to trust. How can trust become an embodied verb, and not just a mental decision? How do we live it into action? When ritual works, it works because it is embodied. The cup of wine is full on havdalah. That is the first reminder. There is enough. The world – at its core – is an abundant place. The spices wake us up. They are sweet. When we hold up our hands to look at the candle, we see the play of shadow and light – we see that both exist, and we must be true to each, and aware of each. We cannot afford a Pollyanna approach. And as my stepdad told me before I left to travel in Europe after high school, Trust, but bind your camel. And the final blessing is the blessing of separation in general. In Judaism to make something holy is to set it aside. Maybe this seems counterintuitive since we’re talking about coming together, but each of us expresses our trust by just trying to love who is right in front of us, or near us, or by choosing a tradition or a craft, or our work – and trusting that through this particular focus, in the end it will serve the greater community. Committing to the small tribe teaches us about commitment to the larger tribe. And then we close the ceremony by singing Eliyahu Hanavi, Elijiah the Prophet, which is our Jewish version of Sam Cooke’s “A Change is Gonna Come.” It’s a commandment in Judaism to hope. Rabbi Arik Asherman of Rabbis for Human Rights, who spoke in the area this past week, said in his peacemaking work, he needed to trust that relationship can be transformative. That even in the darkest times in Israel, he needed to trust that encounter, even with one person, could change things. So perhaps trust is also about allowing ourselves to believe in real transformation through encounter. May we continue to become practitioners of trust. May we learn to recognize the mark of trust in each other’s faces.